Scientists have long suspected that monkeys are capable of mental arithmetics and a new study is helping them prove it. 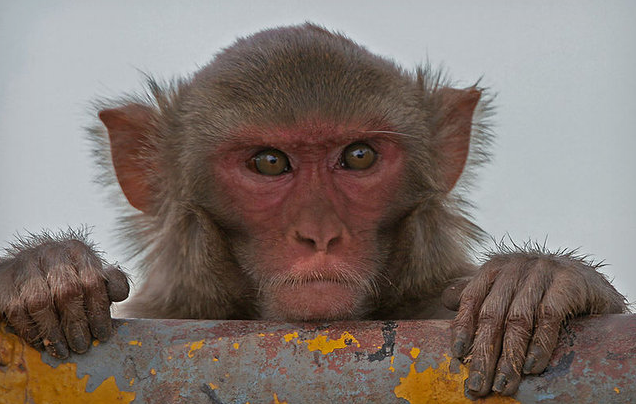 A research team led by neurobiologist Margaret Livingstone trained three rhesus macaques to identify symbols representing the numbers zero to 25. They then taught the test subjects how to perform addition. To eliminate the possibility of rote learning, the team had the monkeys learn an entirely different set of symbols representing the numbers zero to 25. The monkeys were able to reapply their previous knowledge to the new set and continue performing basic mathematics. The image above shows one of the monkeys preparing to choose the four and five combination on the panel. It has learned that the combined value is greater than eight and will therefore yield a larger number of liquid drops. According to the study, all three monkeys were on average capable of choosing the correct answer "well above" 50 percent of the time. This rules out the possibility of chance. What's also interesting is how the monkeys were routinely undervaluing the smaller number in a given equation. This challenges the idea that mammalian brains perceive numbers logarithmically and may help researchers better understand how human beings process numbers.